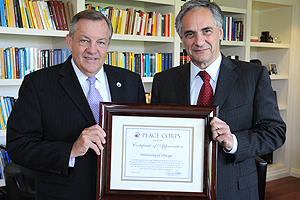 Ron Tschetter (left), Peace Corps Director, visited campus Thursday, May 22 to offer congratulations to President Zimmer for the University’s ranking as the top Peace Corps school of 2008. There are 34 alumni serving in Peace Corps programs internationally, and 654 Chicago alums have joined its ranks since it formed in 1961. Tschetter presented a framed certificate, recognizing the University’s status among colleges or universities with undergraduate enrollments less than 5,000. Wallace Goode Jr., Director of the University of Chicago Community Service Center and Associate Dean of Students, also was presented a special President’s Volunteer Service Award, given to Americans who demonstrate an ongoing commitment to service and inspire others to engage in volunteer work. Tschetter, who trained at the University before he and his wife served in the Peace Corps in India from 1966 to 1968, met with University fourth-years readying to embark on Peace Corps service.